On the rear the dock is equipped with two Thunderbolt 3 connections, Gigabit Ethernet, DisplayPort, a 3.5mm audio jack, and two USB 3.1 type C ports running at 10-gigabit Gen 2 speeds. The front is equipped with two 5-gigabit USB 3.0 type A gen 1 ports, plus a headset jack and a UHS-II-capable SD/microSD slot. 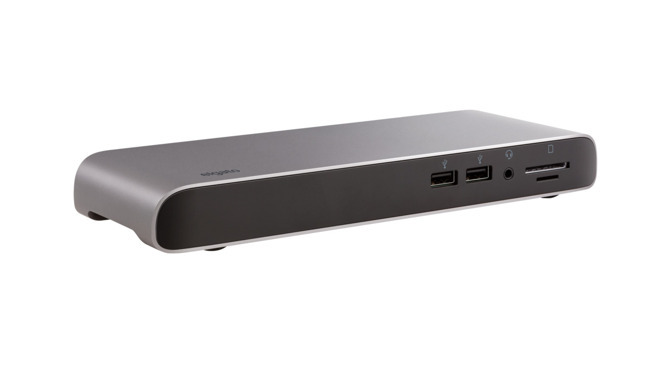 The dock can handle twin 4K displays via DisplayPort and Thunderbolt 3, Elgato said. Using just the free Thunderbolt 3 connection, it supports resolutions up to 5,120 by 2,880. On Macs the accessory has its own menu bar utility, which can eject the dock and all connected storage simultaneously. The Thunderbolt 3 Pro Dock can be preordered from Corsair or Amazon for just under $350. A ship date is unavailable. Normal laptops and desktops should have all these connectors integrated already so who will buy this device for 350+tax? Macbook Air users? It is less for an iMac, say, and more for a single-cable solution for video, power, and all accessories on a desk for a MacBook Air or MacBook Pro. For instance, I've got one Thunderbolt 3 cable going to a CalDigit dock, and an eGPU. This gives me 87W power, ethernet, and the Vega in the eGPU enclosure, all on one cable. This particular dock does seem a bit expensive, though. I wonder when they will start making USB-C hubs? I'd think eventually as people switch over, they will have more than 3 USB-C devices, right? I guess eventually being the key word there. I don't have a single USB-C device yet.. just a USB-C to USB-A adapter we use with my son's laptop to plug in USB-A thumb drives, mostly. Can you even buy many devices (besides storage devices) in USB-C? I haven't seen anything else yet. Just storage devices and docks. About the only thing I've seen has been a select few Flash Drives and some external hard drives. Everyone was exclaiming how USB C was 'the future' when Apple introduced the USB C only MacBooks, but a year and a half later that future is still yet to arrive. Even the thunderbolt connectivity is problematic - USB C does not mean thunderbolt compatibility, and even if the port is compatible, not all USB C cables are. We may have the convenience of a single port now, but along with that we get the confusion of not knowing exactly what the port or cable is capable of. I'd rather have the separate USB & Thunderbolt ports and the clarity they give. As for this dock, it seems quite expensive. I would think it would be best suited as a docking station for when you're working at your desk. Apparently the entire industry has been waiting for chips that can drive these hubs to even exist. I've heard rumors that Intel is releasing some this year. Some fab called "Cypress" just got some into production. 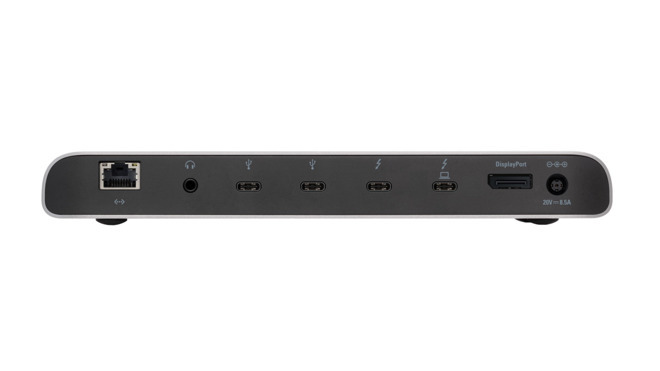 The Titan Ridge Thunderbolt controller can do it now -- as evidenced by this dock in particular. But, that is expensive to implement, and Intel seems to be slacking on the royalty loosening for the protocol. The Cypress chips (by the way, Cypress has been doing USB chips for about 17 years) is probably the first inexpensive one that will hit the market that device manufacturers can use. Interesting... so it is both a lack of actual hardware (chips) and probably consumer demand. I suppose vendors of peripherals will be slow as well, as they'll just include USB-A and an adapter or separate USB-C cable. What we really need is for the peripherals to have USB-C ports on them, so I'd be more inclined to care about having a nice, simple USB-C to USB-C cable to connect it. Until then, it just creates more of a cabling mess.